At Colorado Burger Joint, Waitresses Pack Heat. You definitely don’t see this every day. It’s called Shooters Grill and rightfully so. It is located in Rifle, Colorado about 180 miles west of Denver. Its menu embraces the firearms theme with items like “M16 Burrito”, “Smith and Wesson Grilled Cheese” and “Locked and Loaded Nachos”. And those shotgun shells on the tables, those are salt-and-pepper shakers. 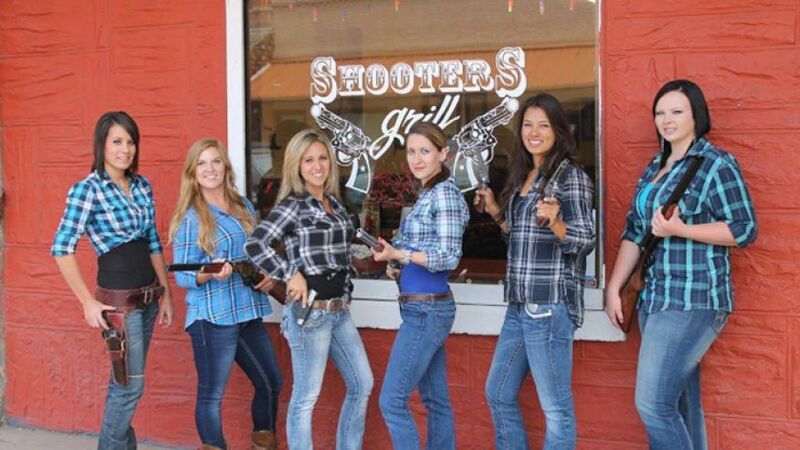 Some of the guns the waitresses carry include the Ruger Blackhawk .357 Ashlee Saenz sports. The owner Lauren Boebert, 27, started the trend when she began carrying a pistol shortly after opening the restaurant a year ago. “I started open carrying maybe a month after we opened just because I am a woman in business and I was there early hours and late nights,” Boebert said. “There was a man beaten to death in the alley behind my restaurant last year. It was very unfortunate”. Then the staff began to follow suit, openly carrying, as it is legal to do so in Colorado. Boebert made sure her staffers who wanted to carry took an extra safety course. Customers don’t mind it. “No one has ever turned around and walked out because they saw a gun”, said Boebert. “They might’ve left because it was too crowded, praise the Lord. But not over the guns”.